The 1994 assault-weapons ban was intended, according to gun-violence experts and the lawmakers who wrote the bill, to reduce the frequency and lethality of mass shootings like the ones in Parkland, Sandy Hook and elsewhere. And on that front, the data shows it had a significant impact. Last week’s horrific massacre of 14 students and three staff members in Parkland, Florida, has ushered in a surge of support for a nationwide ban on the sale of assault weapons. A Quinnipiac poll released Tuesday, for instance, found that 67 percent of Americans, including 53 percent of gun owners, say they favor such a ban — the highest level of support seen on this question since 20 children and six educators were murdered at Sandy Hook Elementary School in 2012. Again the question: Could armed teachers stop shootings? 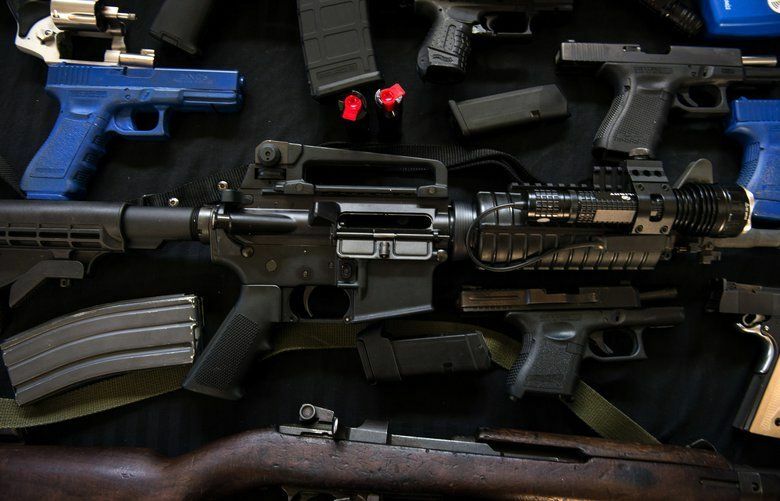 Critics of bans on assault weapons, however, say they do little to save lives. The NRA correctly points out that assault weapons are used only in a tiny fraction of gun crimes. The gun-rights group also notes that a federally funded study of the previous assault-weapons ban, which was in place from 1994 to 2004, concluded that “the ban’s impact on gun violence is likely to be small at best, and perhaps too small for reliable measurement.” Similar points have been made in arguments against a new ban in publications running the ideological gamut from Breitbart to The New York Times to the HuffPost. 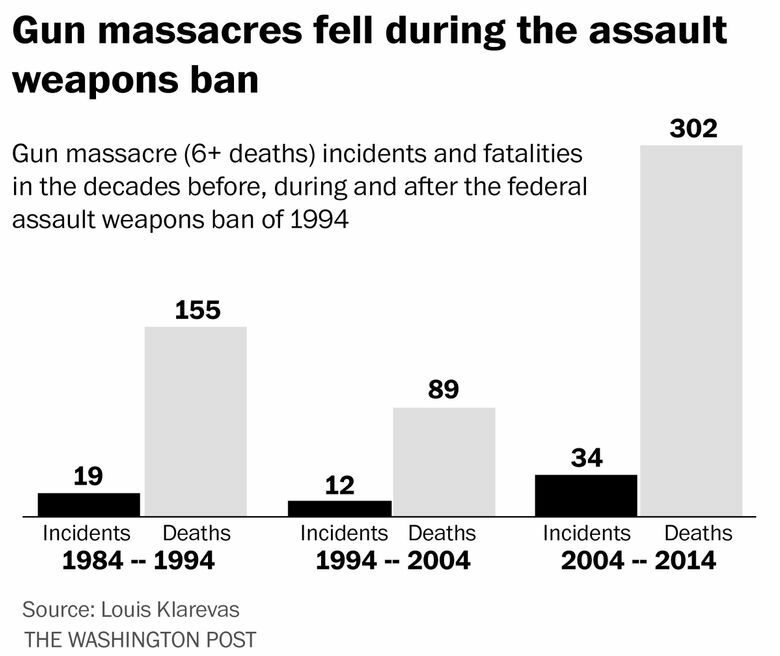 But the 1994 assault-weapons ban was never intended to be a comprehensive fix for “gun violence” writ large. Its purpose, according to gun-violence experts and the lawmakers who wrote the bill, was to reduce the frequency and lethality of mass shootings like the ones in Parkland, Sandy Hook and elsewhere. And on that front, the data shows it had a significant impact. Louis Klarevas, a University of Massachusetts at Boston researcher who wrote a book on mass-shooting violence published in 2016, says that impetus for a federal assault-weapons ban began gathering in 1989. That year Ohio Democratic Sen. Howard Metzenbaum introduced the original bill to ban assault weapons after a gunman armed with an assault rifle killed five children and injured 29 more in a schoolyard in Stockton, California. “The guy used an AK-47 variant, with large capacity magazines” capable of holding 10 or more rounds, Klarevas said. The shooting “got a lot of attention” and galvanized public opinion. National polls conducted in the months following, for instance, showed that over 70 percent of Americans supported bans on assault weapons like the one used in Stockton. But Metzenbaum’s bill didn’t pass, and Congress spent several years debating other assault-weapons measures that were less stringent in nature. None of those were ever signed into law. The final piece of legislation that we now know as the federal assault-weapons ban was signed into law a little over one year after the San Francisco shooting. Klarevas has compiled data on gun massacres involving six or more fatalities for the 50 years before 2016. His numbers show that gun massacres fell significantly during the time the assault-weapons ban was in place, and skyrocketed after the ban lapsed in 2004. A separate mass shooting database compiled by Mother Jones magazine shows a similar trend. Klarevas is particularly concerned about what the numbers show for the years after Congress allowed the assault-weapons ban to lapse. Guns like the ones used in Parkland and in other mass shootings are now among the most popular firearms currently on the market. The proliferation of these guns means that would-be mass shooters have little trouble obtaining them.